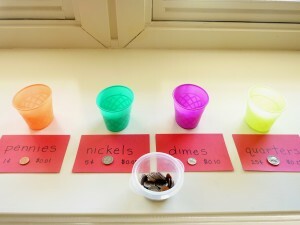 Coin counting is always a bit of a challenge for young children. 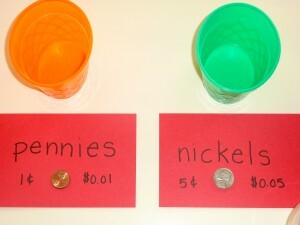 I think that perhaps the way coins are used in real life creates this urgent need to get them counting different coins all together right away before they have a chance to fully grasp what the coins are and what they represent on their own. (I happened to love sorting and counting coins when I was young and would do so to entertain myself at my grandparents’ house but that’s just me!) Now that credit and debit cards are the main form of payment for many people, children’s exposure to coins and paper money is much less which makes it even more of a challenge to reinforce this concept. I have heard “Ughhh!” and “Oh no! He/she just cannot grasp this!” from parents when the concept of working on money comes up (same thing happens with the concept time!) but I want you to know that there are fun ways to build this skill at home with your child. I have a number of different ideas and will do separate posts on them so as not to overwhelm you with information. 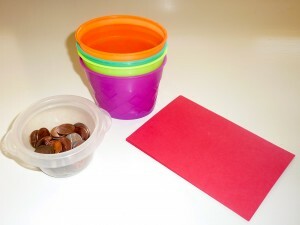 The materials for a coin sorting station: coins, cups, bowls or plates to sort into and index cards (or Post-It Notes) to label where the coins go. Cups with index card labels providing the name of the coin, the value and the coin itself (just set on top). The other two cups with their cards. and he sorted them. We also discussed who was on each of the coins (Abraham Lincoln – penny, Thomas Jefferson – nickel, Franklin D. Roosevelt – dime and George Washington – quarter) to help distinguish them even more from one another while also sneaking in a little history 🙂 . 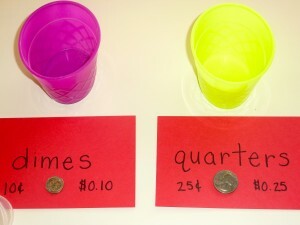 Note: I provide the sample coin because I am not doing this to trick him or test him to see if he can do it. I want him to be making his choices and decisions based on the information he has available – just like we do as adults!! You could also add “How many ___?” and/or “Which has the most/least?” questions but I would see how their attention span is after sorting. 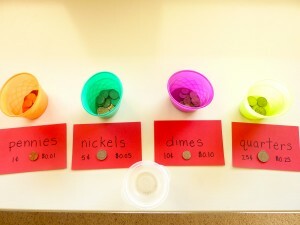 Having them count the coins to answer “How many ___?” could be a station activity on its own more to build counting skills. 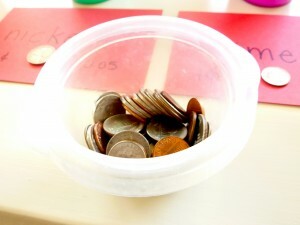 Tomorrow’s post will focus on the next step of coin counting. Once they are able to easily sort the coins, it’s time to count them – not mixing coins quite yet – but counting coins and their values.